Garstang boss Lee Baker said his players proved themselves to be deserved winners of the West Lancashire League Premier Division. The Riversiders ended their season on Monday when they drew 1-1 in their final game at Tempest United. 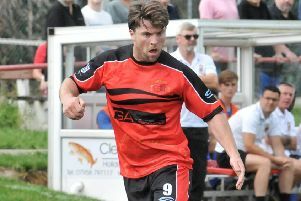 They were already assured of the title following Blackpool Wren Rovers’ defeat at Longridge Town last Saturday. However, Baker insisted that the title, following on from their Richardson Cup victory and Lancashire Shield final, was the icing on the cake. “I said to Neil (Beesley, assistant manager) that someone wouldn’t be looking out for us if we hadn’t won it after scoring the most goals and conceding the fewest. “The statistics don’t lie; we’ve conceded fewer than 30 goals in the league all season and scored more than 90. Baker had prepared his players for the eventuality that they would need to gain a result on Monday to lift the title. Consequently, the pressure was off them to get a result on Monday – even if Baker wasn’t watching on at the weekend. “I had the opportunity to go and watch the game but I couldn’t do that,” he admitted. “One of our players, Kieran O’Connor, did go and there were a few people there texting me. “Instead, I was in the garden and my phone was going made for some reason; I wondered what was going on and it said the score was 4-0. “I thought someone was having a laugh but I phoned Kieran and he said that was actually the score. “Someone said to me that we must have wanted to go out and win the game ourselves but, for the first time in a long time, we were able to walk out and be completely relaxed. “We’d worked on the basis that Wrens were going to win the game so I hadn’t expected Longridge to win if I’m being honest.